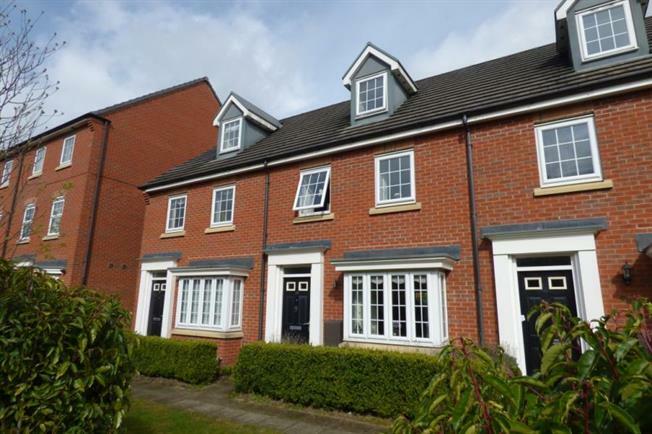 3 Bedroom Semi Detached House For Sale in Warrington for Offers Over £200,000. Positioned on one of Chapelford's most secluded roads and overlooking an established green area, we believe this would be ideal for families who would benefit from allowing their children to play safely without concern of passing traffic. This is a truly fantastic home with impresive room measurements not normal found in conventional two storey homes and is presented to a very high standard. With the implementation of the new train station scheduled to arrive during the spring of 2019 the demand for properties on one of Warrington's most sought after developments has seen a sharp increase and we would urge early enquires to avoid missing out. The property is positioned on the outer perimeter of the village and only a short walk away from Sainsbury's and the Chapelford Farm public house which is famous for its 'Cake-away' and carvery. The accommodation is arranged over three floors with the ground floor enjoying a wonderful formal lounge which allows access to the dining room to the rear which is open plan to the modern kitchen and provides access the ground floor cloakroom/WC. The first floor offers two impressive double bedrooms and a family bathroom which are larger than normally found on conventional two storey homes as the master suite is located on the top floor enjoying a wonderful en-suite shower room and a feature dormer window. There are gardens to both the front and rear with allocated parking being located in the courtyard to the rear.